What is a Commercial Computer? Commercial computing, like industrial computing, is a broad term generally used to describe more intensive computing applications that require hardware that is more capable and more reliable than consumer-grade products. While the language may be similar, here at Logic Supply we have a very specific definition of a commercial computer. A commercial Logic Supply system is characterized by its use of a fan and/or vented chassis for cooling. While we specialize in fanless and ventless computing, we have many clients who rely on our commercial systems as well. 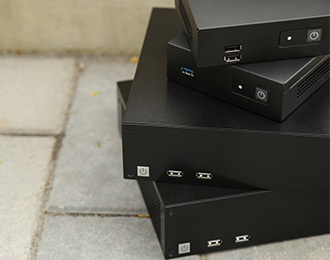 Fanned systems don’t offer the component protection and vibration resistance of our industrial PCs, but our Commercial Line of computers are still built to the highest standards, with all metal enclosures and precisely engineered components. Commercial computers are ideally suited for more controlled environments that don’t require a sealed enclosure. Fanned computers are often used as desktops in offices and control rooms. Commercial systems tend to be affordable and versatile, with enclosures ranging in size from the super compact NC200 to the highly expandable and customizable MC600, making them a solid option for a wide range of applications.